Spanish Dominican preacher; born at Valencia Jan. 23, 1350; died at Vannes, France, April 5, 1419. Basnage supposes that he was of Jewish descent ("Histoire des Juifs," xiv. 701). He entered the Dominican order in Valencia Feb. 5, 1374, and studied at the University of Lerida (1382-84). From 1385 he preached in the Cathedral of Valencia, and soon became famous for his pulpit eloquence. In 1395 he became confessor and private chaplain to the antipope Benedict XIII. at Avignon. In 1398, however, he became a wandering preacher, and traveled through Spain, France, Italy, and Germany. He had a regular retinue of about 300 Flagellants. At times the people followed him in crowds of thousands, forsaking temporarily their occupations to hear him preach or to be cured by him. 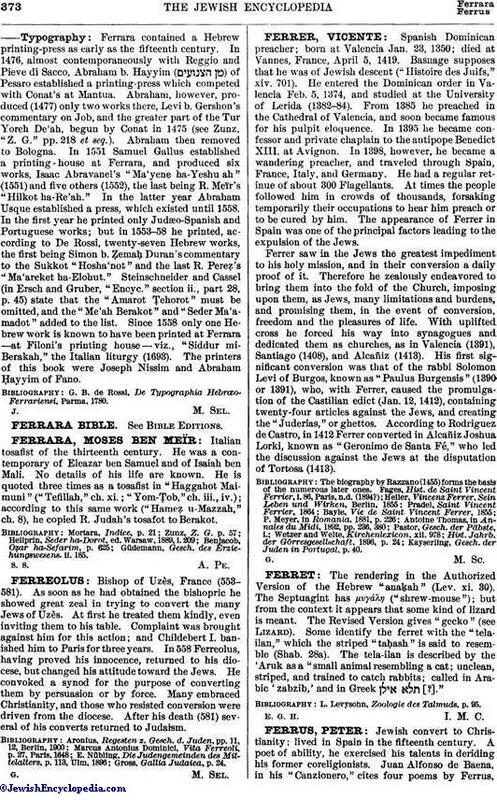 The appearance of Ferrer in Spain was one of the principal factors leading to the expulsion of the Jews. Ferrer saw in the Jews the greatest impediment to his holy mission, and in their conversion a daily proof of it. Therefore he zealously endeavored to bring them into the fold of the Church, imposing upon them, as Jews, many limitations and burdens, and promising them, in the event of conversion, freedom and the pleasures of life. With uplifted cross he forced his way into synagogues and dedicated them as churches, as in Valencia (1391), Santiago (1408), and Alcañiz (1413). His first significant conversion was that of the rabbi Solomon Levi of Burgos, known as "Paulus Burgensis" (1390 or 1391), who, with Ferrer, caused the promulgation of the Castilian edict (Jan. 12, 1412), containing twenty-four articles against the Jews, and creating the "Juderias," or ghettos. According to Rodriguez de Castro, in 1412 Ferrer converted in Alcañiz Joshua Lorki, known as "Geronimo de Santa Fé," who led the discussion against the Jews at the disputation of Tortosa (1413). Kayserling, Gesch. der Juden in Portugal, p. 40.